An original letter of correspondence between brothers and business partners Joshua Coffin Chase and Sydney Octavius Chase. Topics discussed in the letter include a lawsuit filed against the Windermere Company regarding its possession of land purchased from Sam Griffith. Original letter from Joshua Coffin Chase to Sydney Octavius Chase, November 3, 1924: box 49, folder 20.84, Chase Collection (MS 14), Special and Area Studies Collections, George A. Smathers Libraries, University of Florida, Gainesville, Florida. 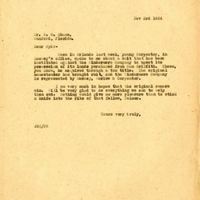 Digital reproduction of original letter from Joshua Coffin Chase to Sydney Octavius Chase, November 3, 1924. When in Orlando last week, young Carpenter, in Massey's office, spoke to me about a suit that has been instituted against the Windermere Company to upset its possession of its lands purchased from Sam Griffith. These, you know, he acquired through a tax title. The original homesteader has brought suit, and the Windermere Company is represented by Massey, Warlow & Carpenter. I am very much in hopes that the original owners win. Will be very glad to do everything we can to help the, out. Nothing would give more pleasure than to stick a knife into the ribs of that fellow, Palmer. Chase, Joshua Coffin. 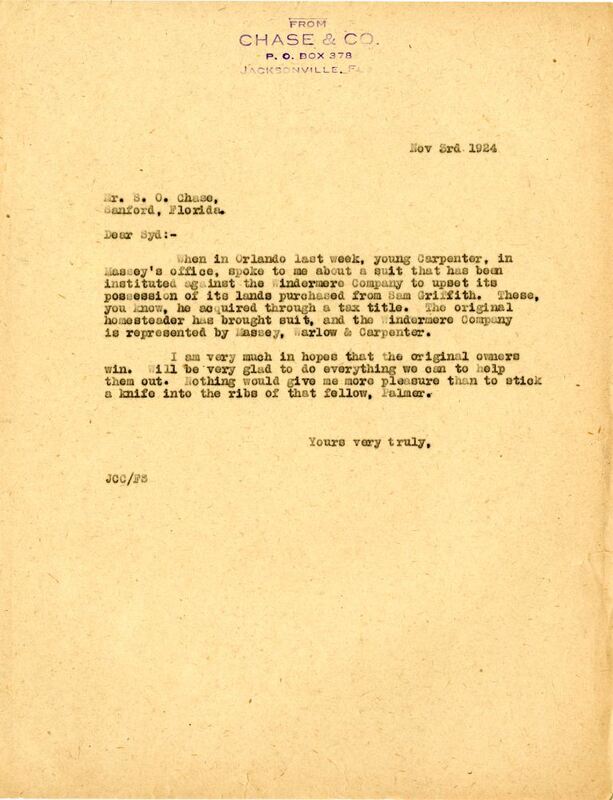 “Letter from Joshua Coffin Chase to Sydney Octavius Chase (November 3, 1924).” RICHES of Central Florida accessed April 21, 2019, https://richesmi.cah.ucf.edu/omeka/items/show/2736.